Can You Still Get a Double Word Score? Hardly a unique idea here, folks……far from it. But I searched high and low on the internets and can’t find a single decent image of one. Guess it’s up to us to solve that. 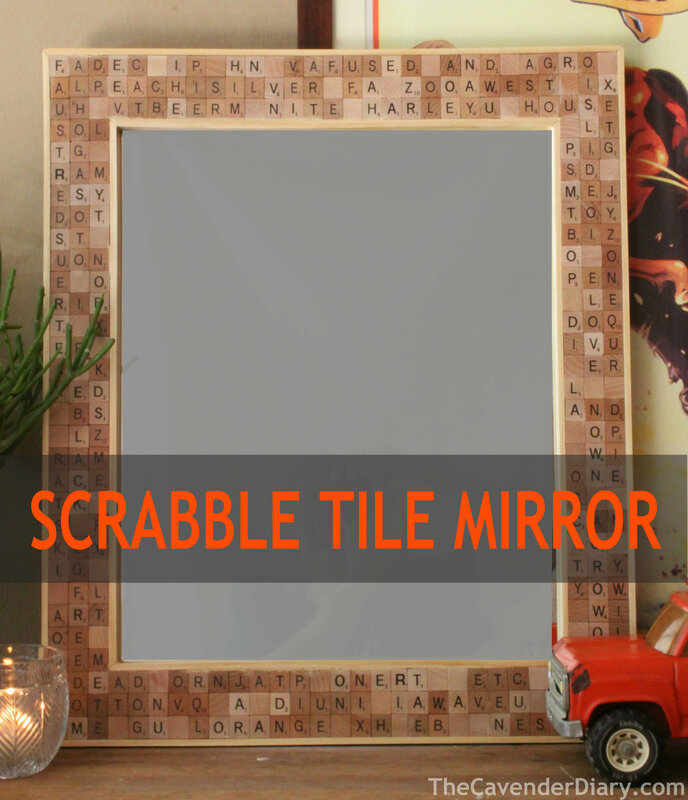 What better way to frame a mirror than with scrabble tiles? They sell the tiles solo, just for projects and I can only assume; scrap booking. We found them on Amazon, pretty reasonable too, 10 bucks for 100 (10 cents each if you’re doing the math). It’s cheaper than buying the game just for the tiles…….unless you find the complete box at thrift stores or garage sales. 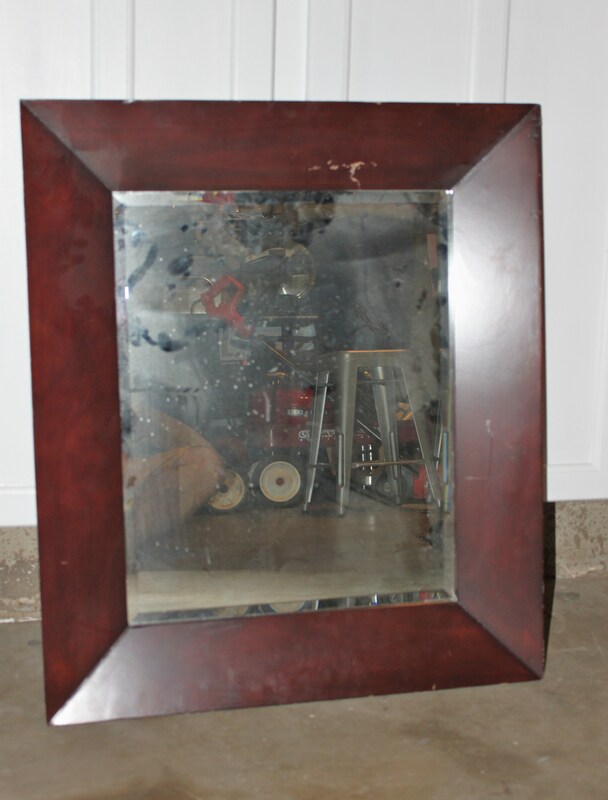 Sure, the frame is a little scratched, but every one of you knows damn well that I would just paint that sucker black anyway. 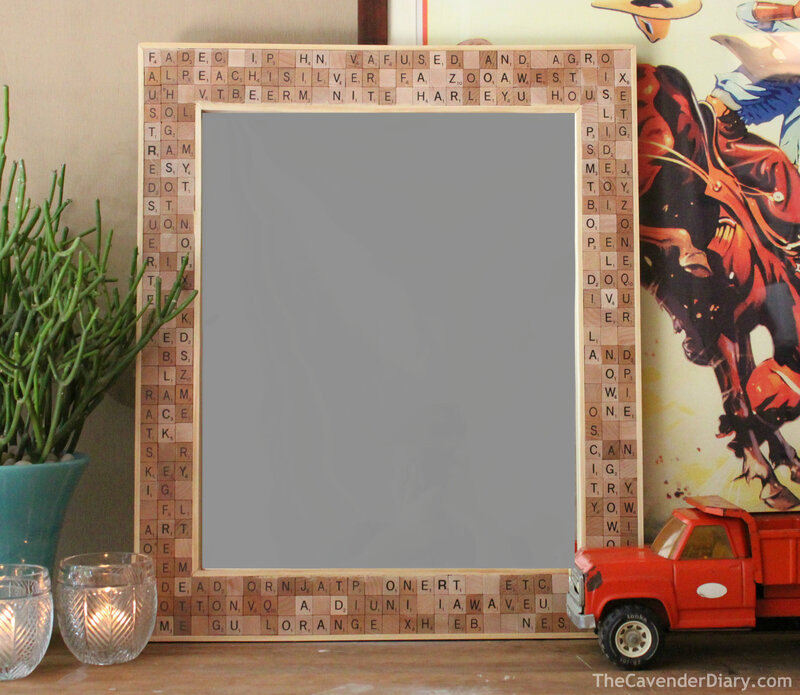 I Lay out my Scrabble pieces across the top and side of the mirror to gage the size of frame I need to cut. 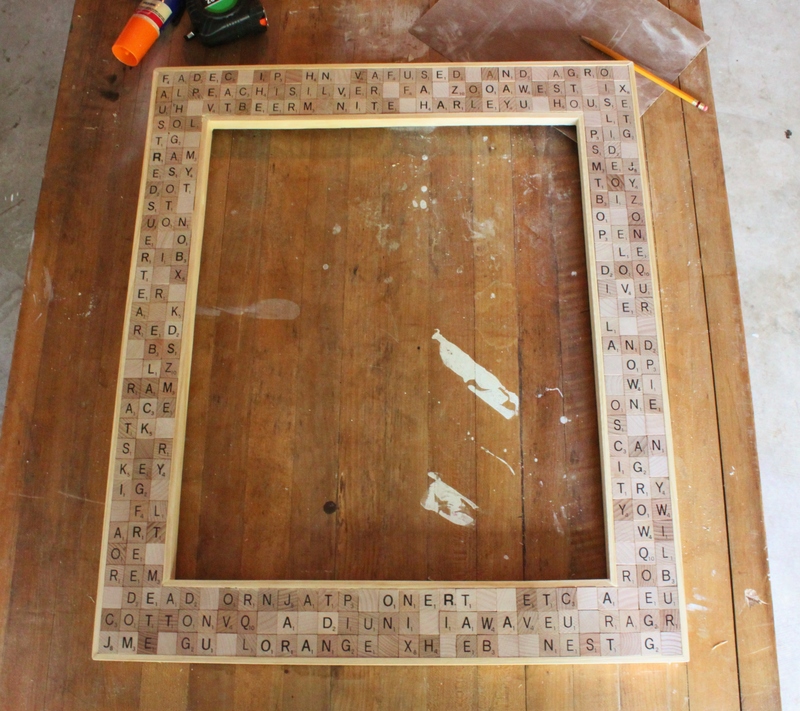 Extending 3 tiles on all 4 sides makes my frame 20 7/8″ X 24 7/8″ with a 16 1/2″ X 20 1/2″ opening. 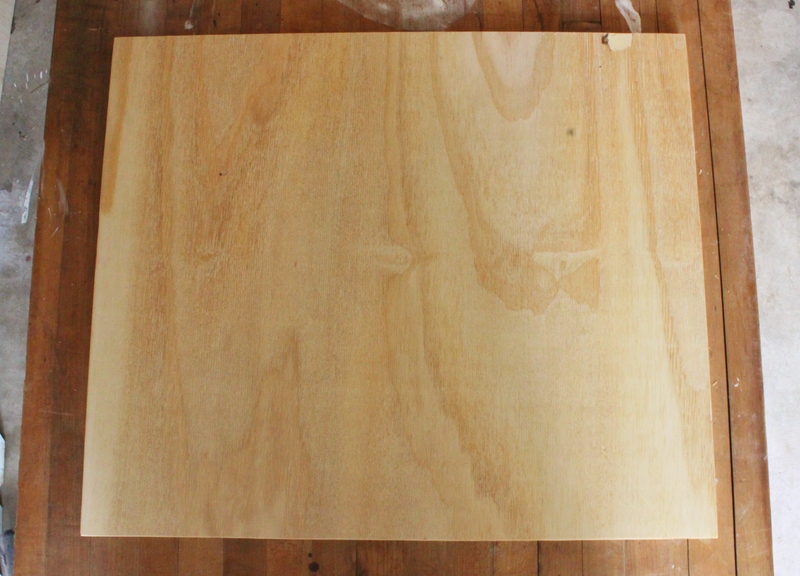 We started with a sheet of plywood from our “wood scrap pile” in the garage. Pretty sure this was left over from the banquette. 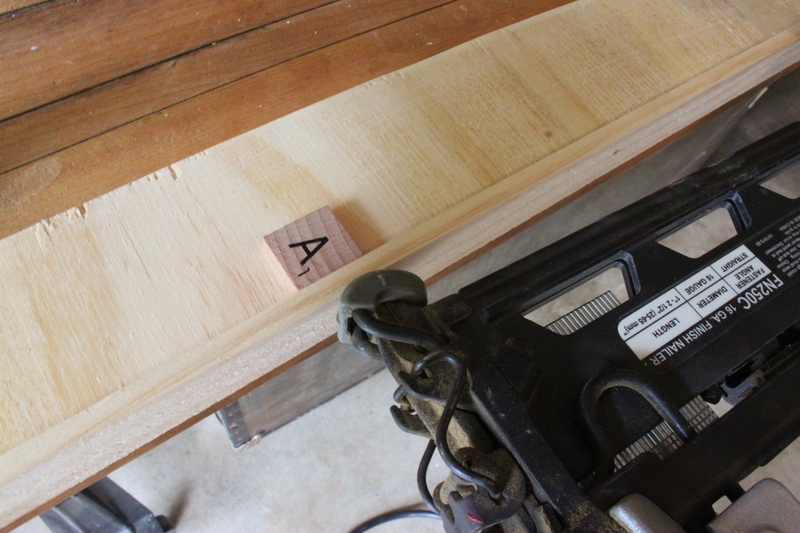 I used the table saw to cut it to 20 7/8 X 24 7/8″. 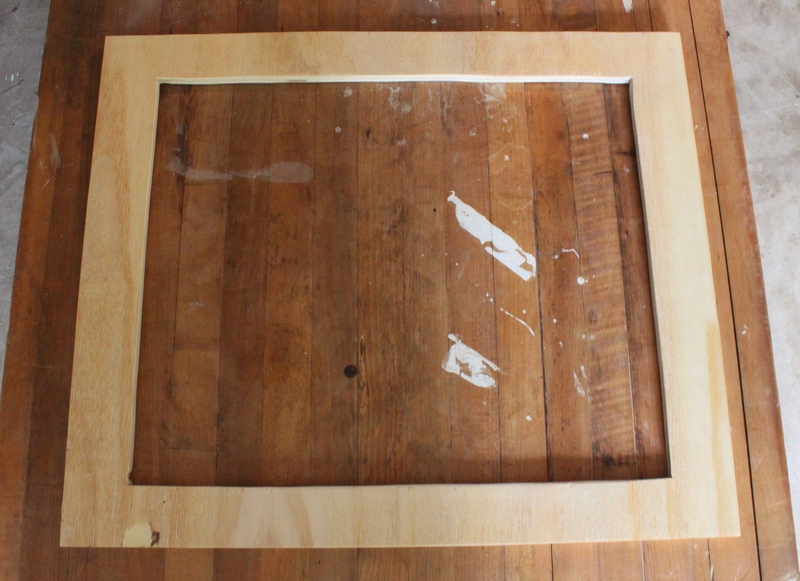 To cut out the inside of the frame, I measure out 2 3/8″ from the top and bottom, and 2 1/4″ from both sides. 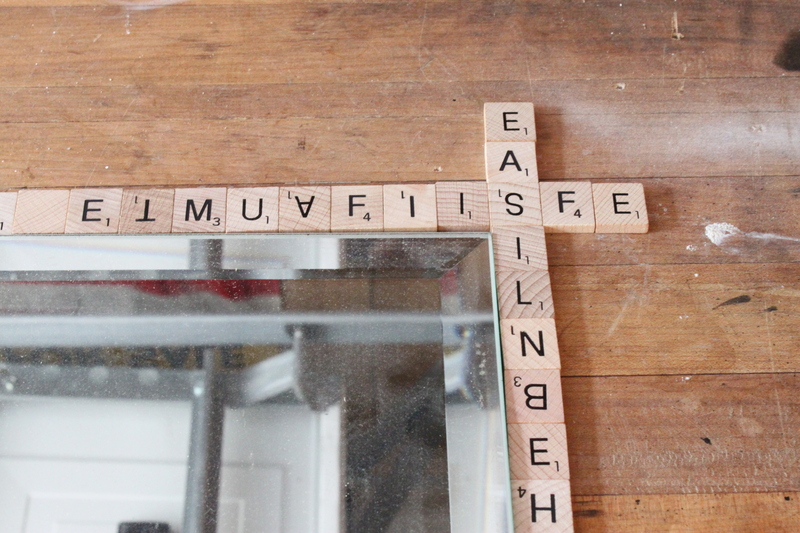 Far from perfectly straight lines……..but I’m pretty sure the scrabble tiles will hide all the imperfections. Another way to hide those imperfections is the trim. 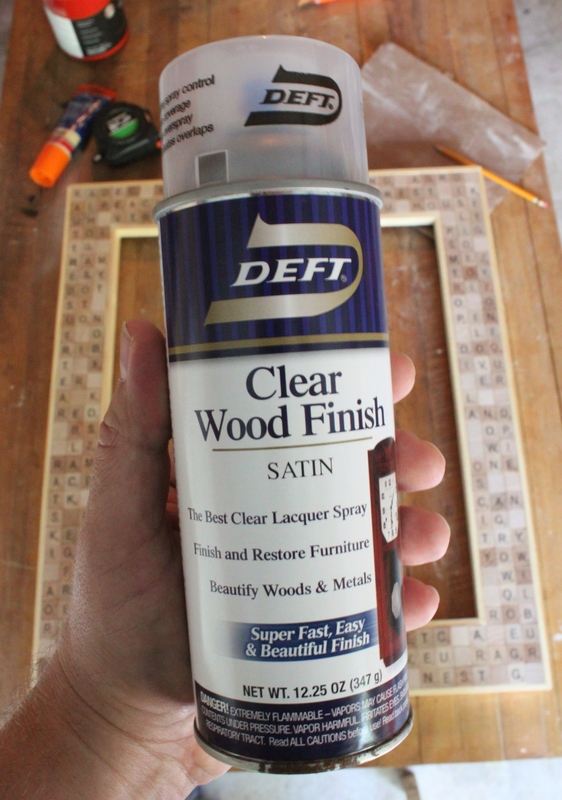 I found flat lattice by the foot, it’s about 1 inch wide and 1/4 inch thick, and used it to trim the outside of the frame. 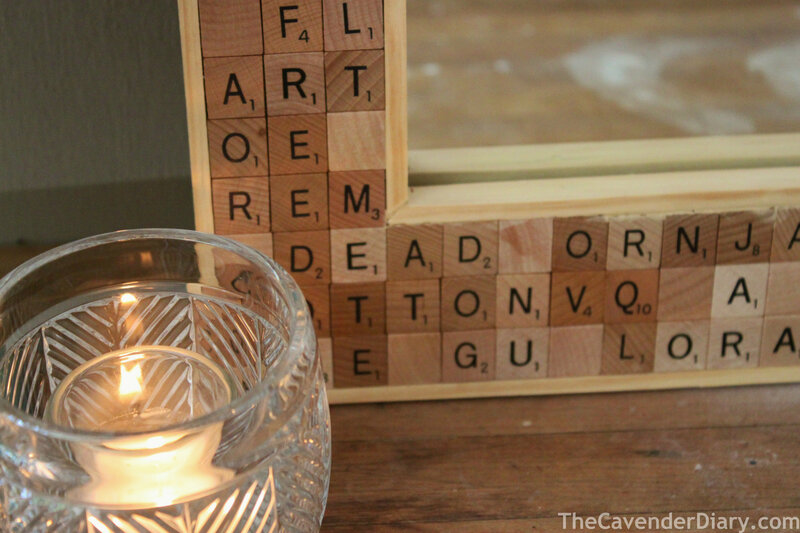 I nailed it on with brads using a Scrabble tile to judge the depth of my sides. 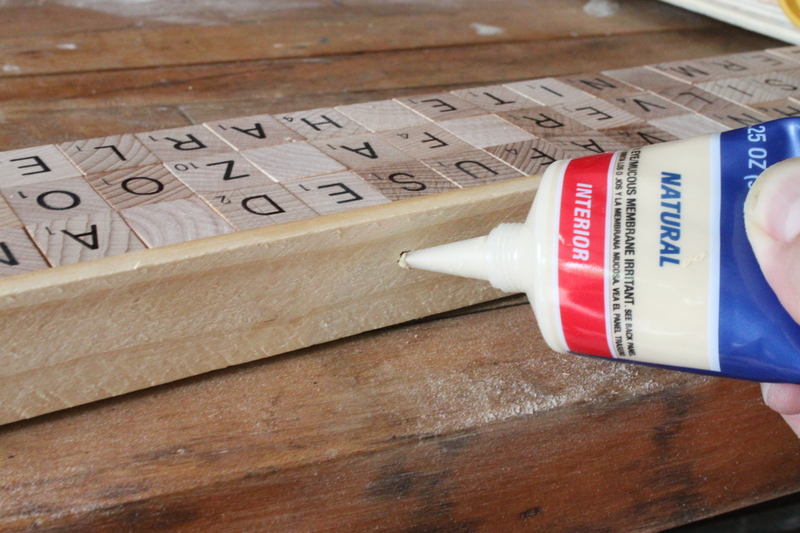 Now that I have the outside edge set, I can start glueing the tiles down………with Elmer’s Wood Glue Max. After all my tiles are set, and dry – only takes a few hours – I glue and clamp the same lattice trim on the inside of the frame also. 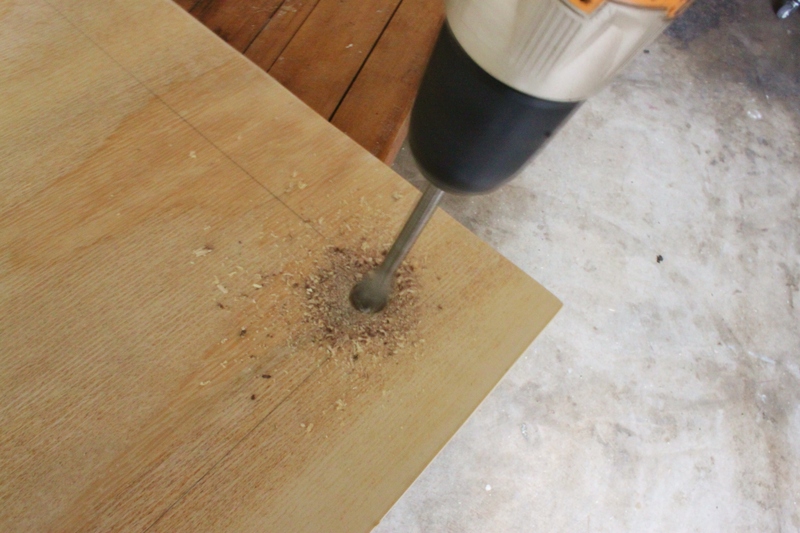 A little natural wood filler hides any brad holes, or slight imperfections. I tried to add some words that meant something to us; favorite colors, foods, even the name of my old dog……..and Jamie’s horse. Because I don’t want an overly glossy frame, I spray it with a Deft Clear Wood Finish in satin. 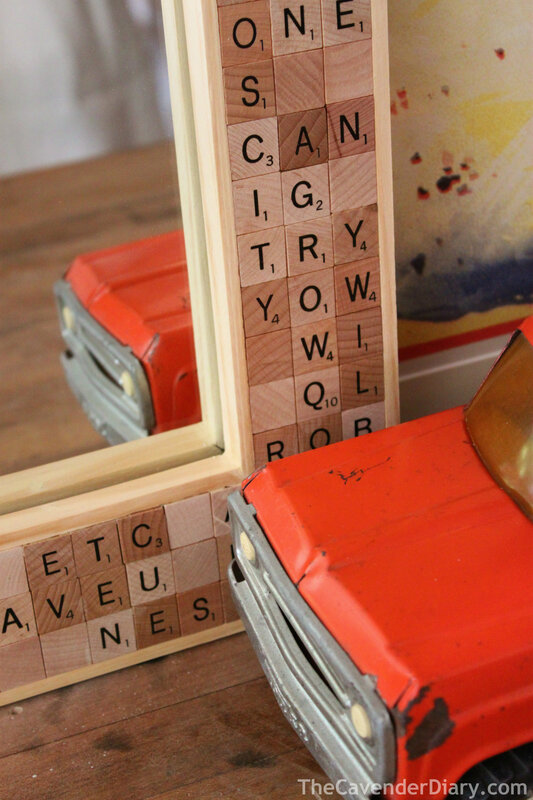 I glued my mirror onto the back with liquid nails, let it dry, and……. But still charming for days. I usually am about these things. L. O. V. E. this! 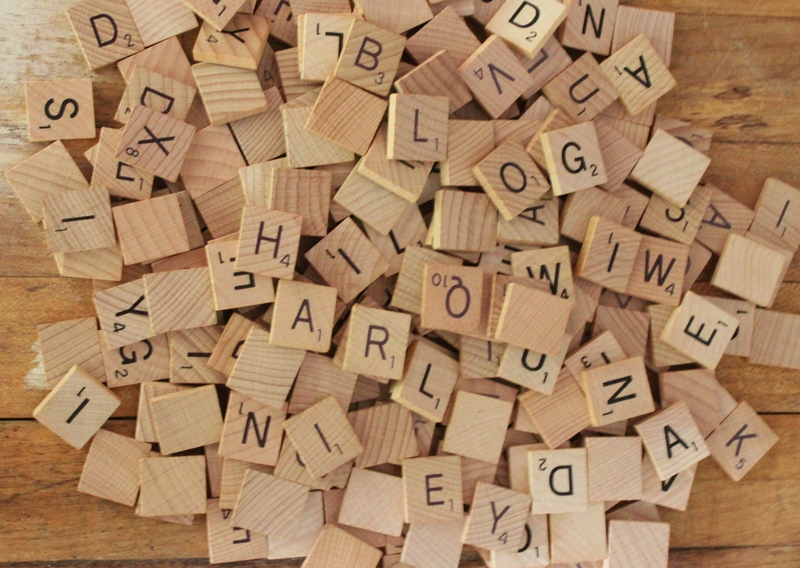 I’m a big scrabble fan. What fun! I am in awe of your measuring ability. I think I’m a hoarder because I want to purchase those 100 tiles just because I might need them some day! It looks great! I must admit, the first word that I noticed was ‘dead’. I guess that says something about me? I love that you chose to add words that have meaning to you. How unique! 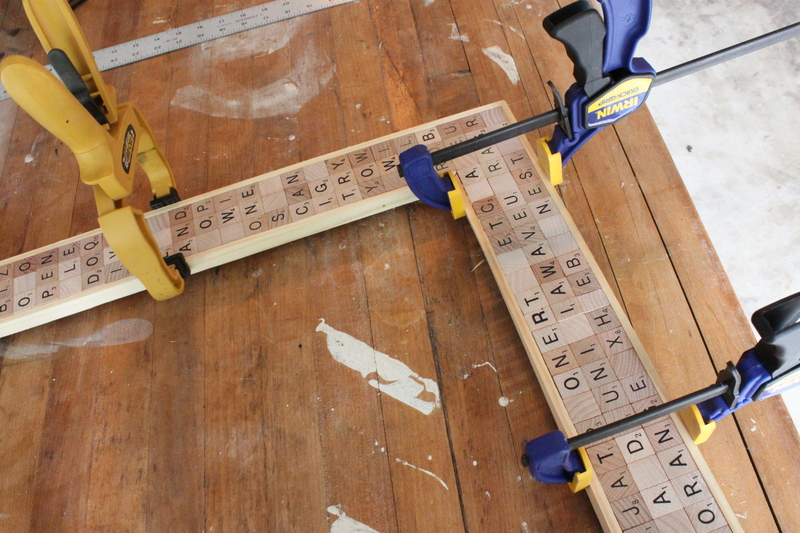 Ok, a tabletop of Scrabble letters sound really cool…..wish I’d thought of it. Thank you for your genius idea! I’ll do this as a project.